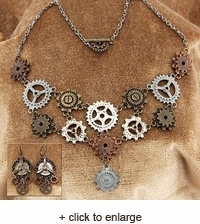 Gears Galore is a phrase that aptly describes the Steampunk Multi-Gear Necklace and Earring Set. Its clever, over-the-top design fits perfectly with almost any Neo-Victorian outfit, a stylish accompaniment to a steam-powered adventure. This jewelry set includes a beautiful pair of earrings designed to look like propellers. 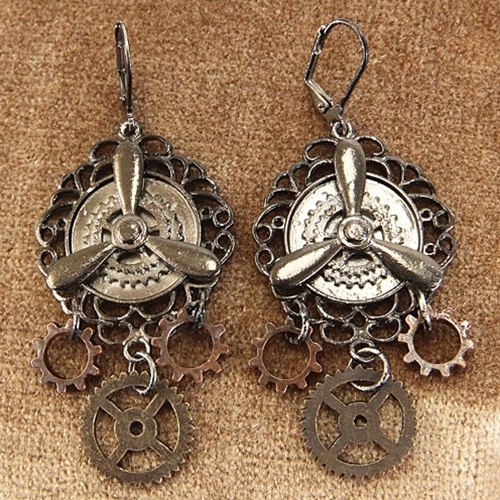 Gears and cogwheels dangle from the ornate scroll work that accents the edges. The earrings are fitted with lever back clasps. 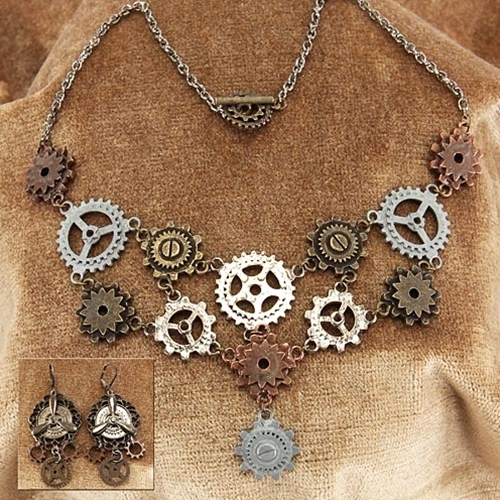 The necklace displays a delightful variety of gears and cogs. They come in all different shapes, sizes, and colors, including silver, brass, and copper. A gear-shaped toggle clasp provides closure at the end of the single curb chain.